Welcome back to our comprehensive article series on how to leverage Facebook retargeting to increase conversions, leads and sales! In this detailed content series, we are outlining a step-by-step blueprint of how you can use Facebook retargeting to recover lost conversions and traffic, and reengage warm leads. In Part 3 below, we will discuss what the Facebook pixel is and how to install it on your website. And don’t worry, you don’t need to be a tech nerd or hire one to do it. In Part 2 of this series, we discussed website custom audiences and how advertisers can use them to track their visitors’ website activity and retarget them according to their behavior. 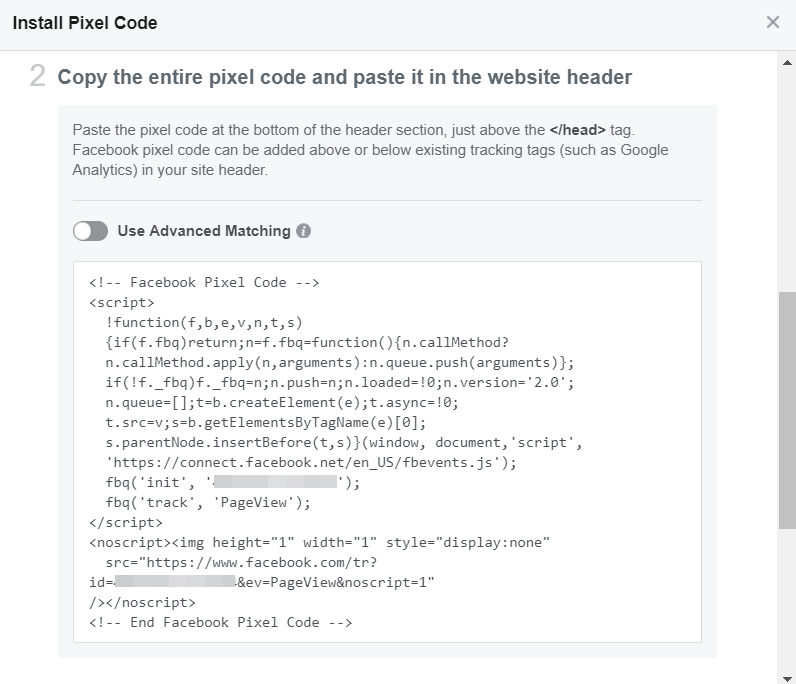 To track your website visitors for your custom audiences, Facebook requires you to install a unique pixel (piece of code) on your site. 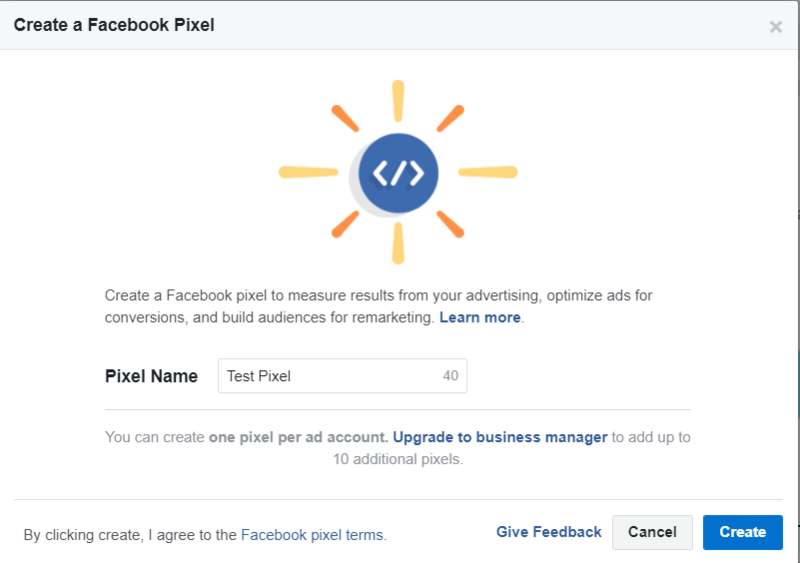 Aside from creating custom audiences, installing the Facebook pixel will also allow you to measure conversion rates for your ads. As an example, if you are sending ads to an opt-in landing page, set a conversion to fire when a person lands on your confirmation page. You can set this up for any conversion action. 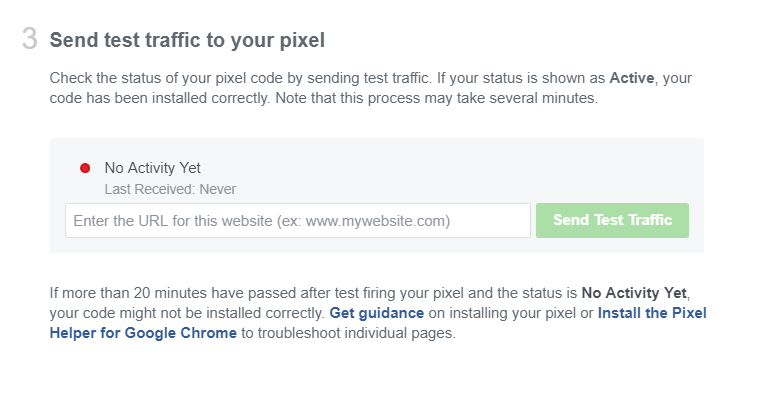 To do this effectively, you will need to install the pixel on the pages on which you are tracking your website visitors’ activity. 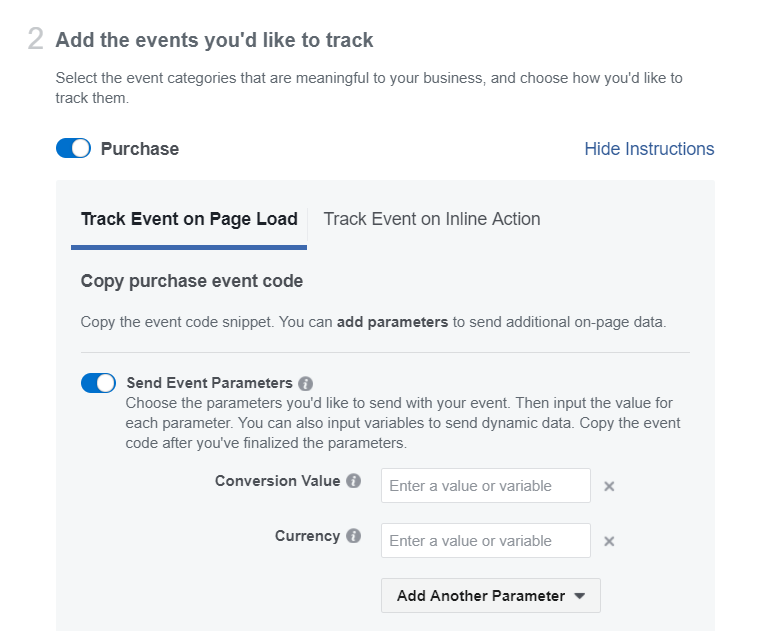 Facebook’s retargeting code includes two parts: the base pixel code and the optional event code. 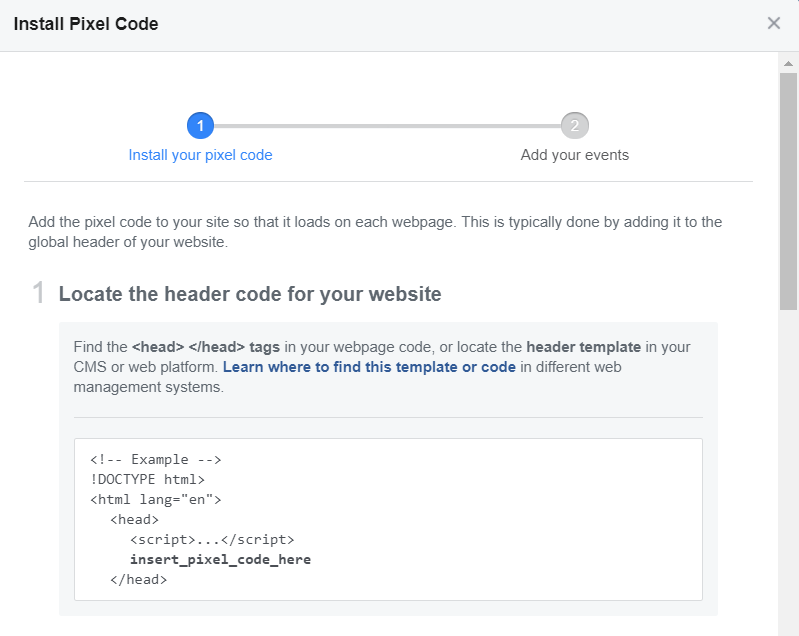 The base pixel code tracks all of your website traffic, and the event code tracks specific actions your visitors take on your pages. Search: Tracks visitors’ searches. Example: You want to track how many visitors are searching for “white tennis sneakers” on your site. Place the event code on the search results page for that query. Add To Cart: Tracks when users add a product to their shopping cart. Use this event code to retarget people who added a product to the cart but did not purchase. Add To Wishlist: Tracks when users add a product to their wishlist. Retarget these visitors with product images of items from their wishlist. Initiate Checkout: Tracks people initiating the checkout process. 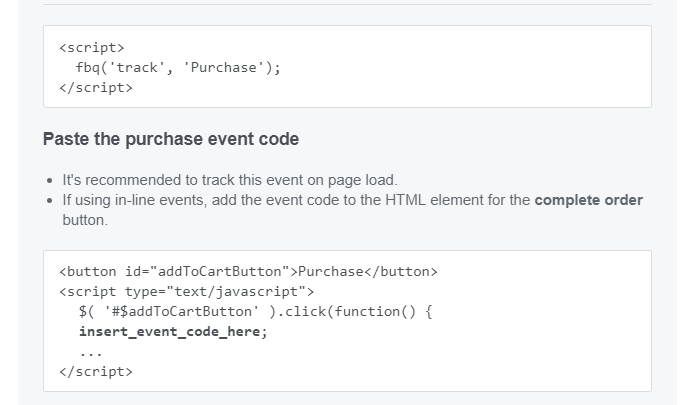 Place the event code on the page where visitors initiate the checkout process. Add Payment Info: Tracks when visitors add payment information during checkout. Run ads to retarget the people who submitted payment but did not finalize the purchase. Purchase: Place this code on your purchase confirmation page to track current customers. Retarget them with your ads when you want to introduce new products and services to them. Complete Registration: Place this code on a confirmation page after visitors signed up for an event. 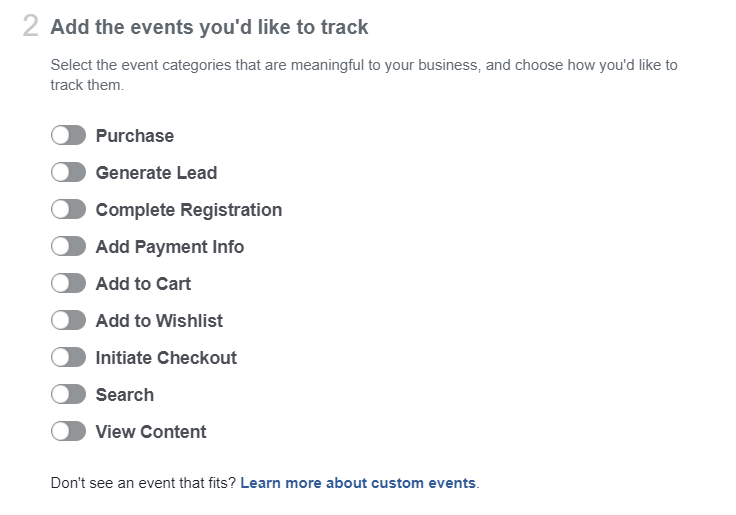 Custom: Though the above list will satisfy the majority of businesses, if you are more tech savvy, add your own custom event parameters to track events unique to your business organization. What if I don’t have my own website? 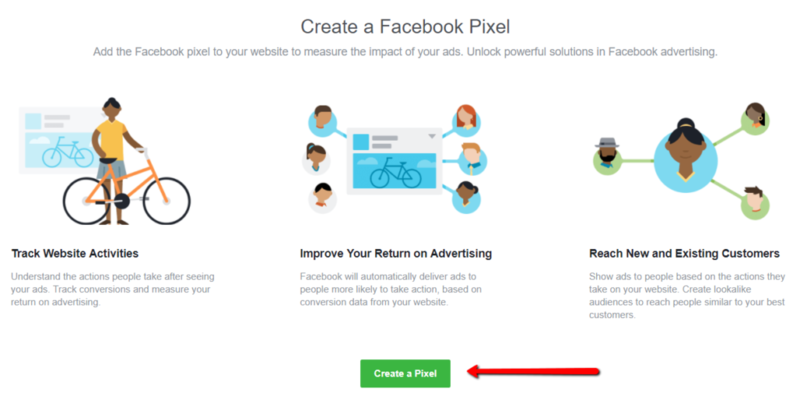 You don’t need your own website to install the Facebook pixel and track visitors. If you are using a third-party website, such as LeadPages, Shopify or WordPress, these popular platforms will have instructions on how to install the pixel, which are generally easy to follow. Here is some info from Facebook on third-party platforms. Click Create a Pixel when you are ready. Create a name for your pixel (this name can be changed later) and read Facebook’s pixel terms before you proceed. When you are finished, click Create. Select the option that fits your situation. Tag Manager: If you are using a third-party website, select this option to get instructions from Facebook on how to add the pixel to your website. Facebook lists instructions for eight providers, but if your provider is not on the list, you can still add the code if your website includes that functionality. Contact your provider for help. Manual Install: If you have your own website or you are ready to add this code to your third-party website, this is the option to choose. 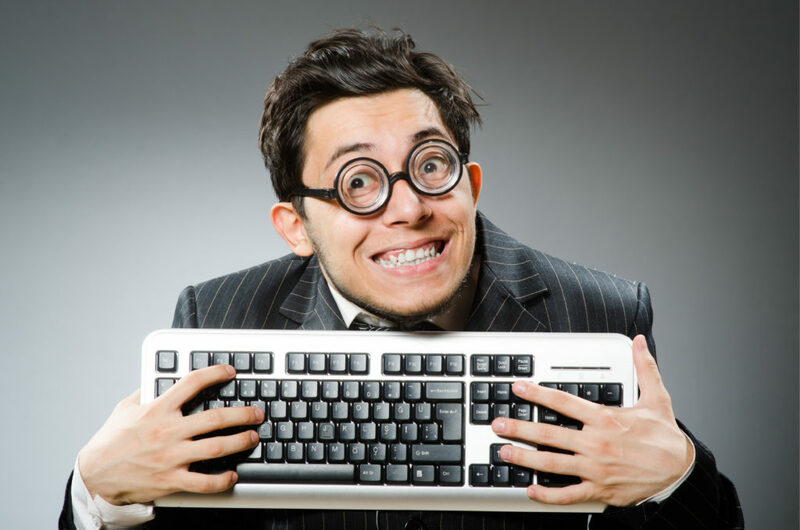 Email a Developer: If you have your own website and you work with a developer who handles the code, email the code directly to your developer. 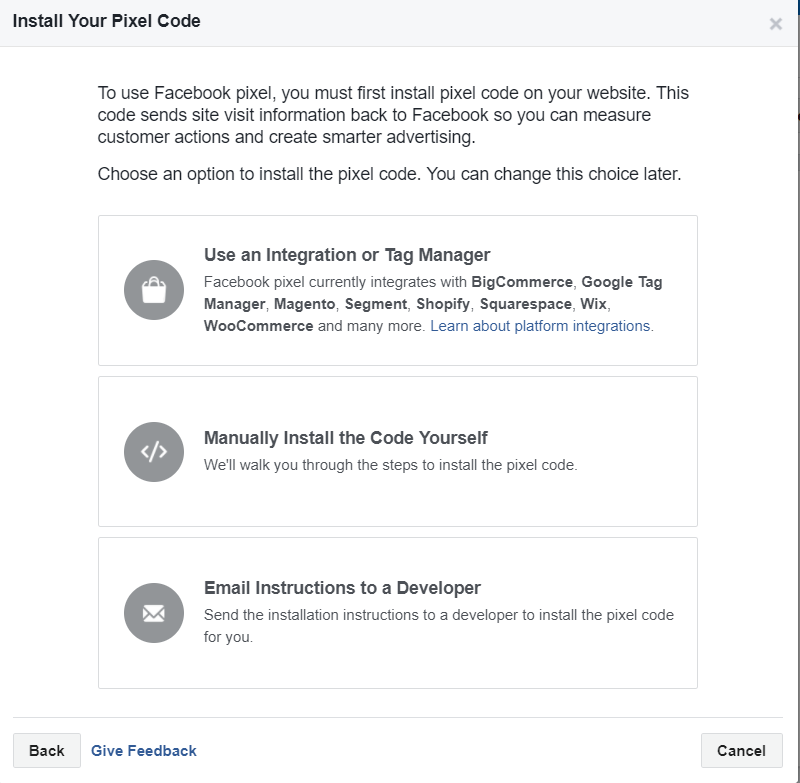 When you click to manually install the Facebook pixel, you will see a pop-up that displays instructions on where to install the Facebook base pixel code. Facebook then shows you the actual base code to copy and paste. Reminder: This is just the base pixel code, which is required to launch retargeting ads on Facebook. 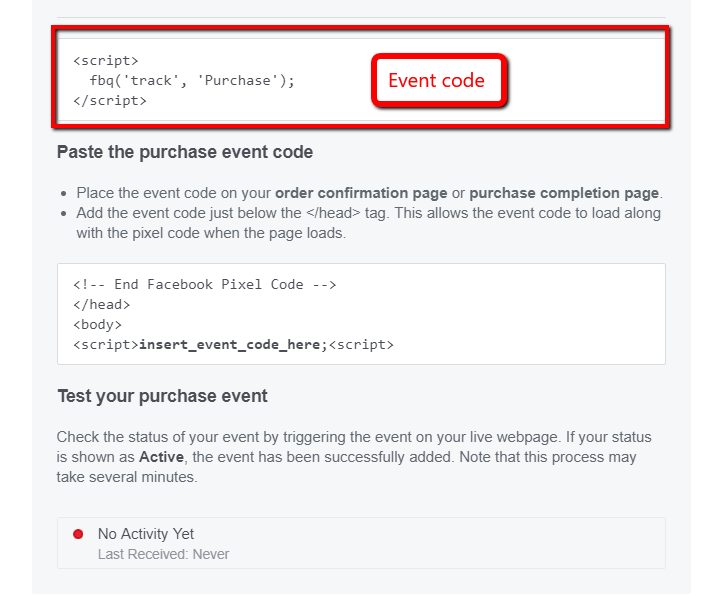 The event code is optional code you can add later to track specific events. We will discuss event code a little later. Copy this pixel code and paste it inside your header tags on every page of your website. Note that in the image below, sections of the code have been blurred out for privacy, but your code will include custom numbers specific to your account. If you are using a third-party website, follow the instructions for that platform to add your code to the header section. Each platform will have an area for the header where you can add your code. 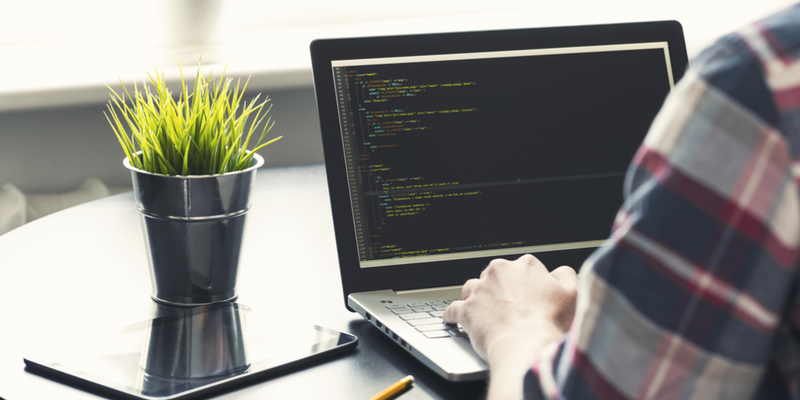 In the case of WordPress, use a plugin like Pixel Caffeine to add the code easily. Allow at least 20 minutes after you install the pixel before you check its status. In a later section in this article, we will go into more detail on how to check if your pixel is firing correctly. If you are ready to create an event code, simply click “Continue” from the initial pop-up we talked about in the last section. Or, if you are no longer within the pop-up interface, get back there by going to the Events Manager page, then clicking “Details” on your pixel. When you click “Set Up,” you will see the pop-up again. When navigating to the next step of this pop-up (Events), you will see some instructional information from Facebook. We have already discussed some of this information, but if you are unfamiliar with Facebook events, I recommend you read it. Scroll down to check off the event you want to track. Click to turn on one of the events to get the code. I clicked on Purchase for the sake of this demo. Once you click the event, you will see more information appear. Track Event on Page Load: Choose this option when you want to track someone being directed to a new page. Example: A visitor makes a purchase and lands on a purchase confirmation page. 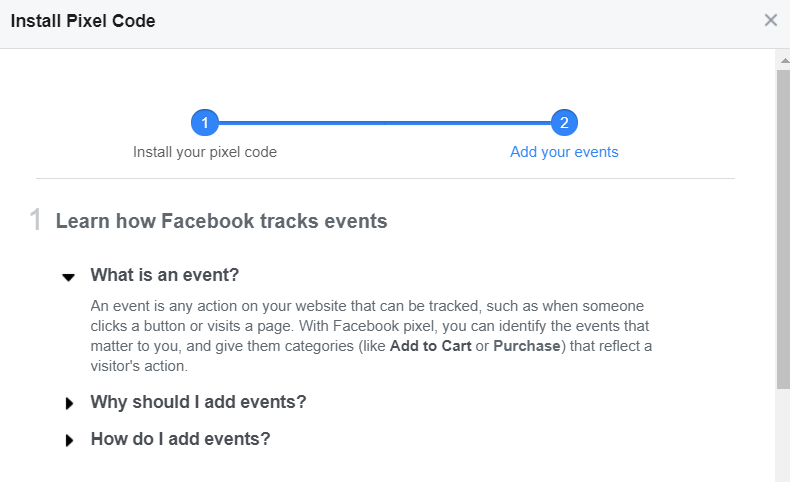 Track Event on Inline Action: Choose this option to track on-page events that require someone to click something such as a button or link. You can also add optional parameters. Facebook offers the Conversion Value and Currency parameters for most of the events where indicated. All the events include the same parameters except for the Search event, which uses Search String and Content ID. If you click the Add another parameter drop-down, you will see Content ID, Content Type and Basket Contents. Each event will have additional parameters you can use. To learn more about parameters and which ones would fit your advertising campaign, see Facebook’s instructions here. Scroll down in the pop-up and you will see the event code along with instructions on where to insert it into your Facebook pixel. Place this code below the head tag inside your body tags. This is in contrast to the Facebook pixel, which gets added inside the header tags. Following these instructions for your Purchase event, you would add this purchase event code to the HTML code for your complete order button. To sum up, for the Track Event on Inline Action, place the code inside the script tags of the action you want to track. IMPORTANT: Each event may have differing code and instructions depending on the event and parameter you chose. Follow the directions under each event. How do I know if my pixel and events are working correctly? In the last section, we discussed how to check if your Facebook pixel is active when navigating through the pop-up. 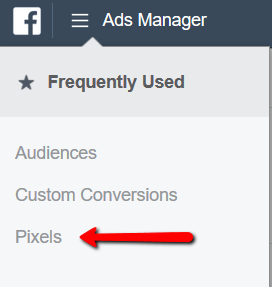 You can also check the status of your Facebook pixel by reviewing your Pixel page in your ad manager. I also want to introduce you to a convenient tool that Facebook offers called Pixel Helper. Pixel Helper is a Google Chrome plugin extension. Once installed, you can review individual pages of your website and make sure your pixels and events are firing. I realize this information can be somewhat overwhelming, especially if you have never created or installed a Facebook pixel before. It may also take some practice and additional reading to understand how the event codes connect to your website and your visitors’ actions. I recommend you read through this article a couple of times and keep it as a guide as you create your pixel. Be sure to also visit the resources I linked to throughout the article. Facebook also has a lot of helpful material on its website. In Part 4 of this Facebook retargeting series, we will talk about how to design high-converting, high-quality ads for your Facebook retargeting campaign. This information is CRITICAL to launching retargeting campaigns that perform well and generate a return on investment. This is one you won’t want to miss.